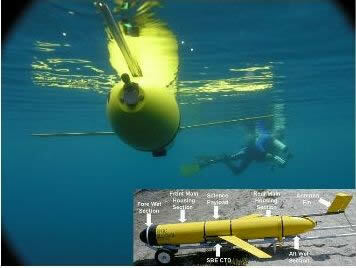 Main Objective and Methodology: The objective of this project is to develop a data assimilative physical-optical modeling-observation system that consists of a fleet of sensor-equipped autonomous gliders (see foto to the right) and data assimilative physical/bio-optical models in order to improve the predictive skill for forecasting of ocean color and to improve physical models by using ocean color to discriminate hydrographic features not detectable using traditional data streams (i.e. SST and SSH). 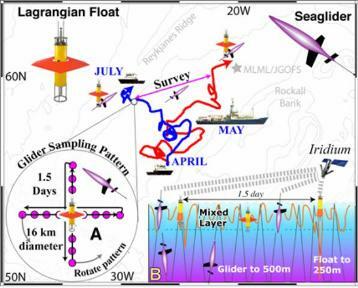 The field effort, coordinated by Rutgers’ Coastal Ocean Observations Laboratory (COOL), includes the deployment of a fleet of autonomous gliders on the New Jersey continental shelf in the Mid-Atlantic Bight from spring through summer of 2007 and 2008. Data assimilative coupled physical/bio-optical models will be implemented using ROMS (Regional Ocean Modeling System). MEMG's role in this project is the implementation of biological and bio-optical model codes and assimilation of bio-optical data. Opportunities: Opportunities for graduate studies exists through this project. Main Objective and Methodology: The objective of this study is to measure carbon fluxes in the North Atlantic spring bloom by deploying a cutting edge autonomous observing system. Net CO2 uptake in the Atlantic Ocean north of 50oN accounts for about 25% of the global total. The biological pump, most importantly the spring bloom, drives this uptake. Previous studies have shown the importance of small temporal and spatial scales, i.e. ecosystem patchiness, during the bloom, but have had limited success in resolving these scales. In this study, Lagrangian floats will be used that follow water parcels in the mixed layer; each float will be paired with roving gliders to characterize its surroundings and to measure – in three dimensions over time – the vertical and horizontal mixing rates and key carbon system components and rates. Phytoplankton and organic carbon will be quantified through a suite of optical proxies, oxygen by two different sensors, and nitrate by in situ UV spectrometry. Main Objective and Methodology: The objective of this multi-investigator project is to improve our understanding of the interactions of physical, biological, and geochemical processes on the western Louisiana shelf as this is critical for a comprehensive description of the mechanisms that control hypoxia and its variability. This project includes moored and remote sensing observations of the middle and western Louisiana Shelf that will complement a coupled physical-biogeochemical modeling element. My role in this project is to implement a biogeochemical module within the coupled ROMS model in order to explicitly describe the oxygen dynamics.